O God, who to safeguard the Catholic faith and to restore all things in Christ, filled Pope Saint Pius the Tenth with heavenly wisdom and apostolic fortitude, graciously grant that, following his teaching and example, we may gain an eternal prize. Through our Lord Jesus Christ, your Son, who lives and reigns with you in the unity of the Holy Spirit, one God, for ever and ever. Who Are The Modernists Of The Encyclical? | A. Vieban S.S.
Joseph Sarto was born in humble circumstances at Riese, a small village in Venetia, on June 2, 1835. He was successively curate, parish priest, bishop of Mantua, Patriarch of Venice — offices to which his keen intelligence, hard work and great piety caused him to be quickly promoted. He was elected Pope on August 4, 1903, and took the name of Pius X. As chief pastor of the Church he displayed untiring self-sacrifice and great energy; he was an intrepid defender of the purity of Christian doctrine. He realized to the full the value of the liturgy as the prayer of the Church and the solid basis that it furnishes for the devotion of Christian people; he worked for the restoration of the worship of the Church, especially plainchant, so that Christian people, as he put it, might find beauty in their public prayer. He spared no effort to propagate the practice, so great an aid to holiness, of early, frequent and daily communion. He died August 20, 1914 and was canonized on May 29, 1954. According to the 1962 Missal of St. John XXIII the Extraordinary Form of the Roman Rite, today is the feast of St. Jane Frances de Chantal whose feast in the Ordinary Form is celebrated on August 18. The feast of St. Pius X was transferred from September 3. Historically today is the feast of Our Lady of Knock, where Our Lady is said to have appeared in Ireland with St. Joseph and St. John the Evangelist at the church's south gable on a wet and windswept evening in August and was witnessed by 15 people. The future Pope-Saint of the twentieth century was born at Riese in Venetia on June 2, 1835, his name, Joseph Sarto. After ordination at the age of twenty-three (by special dispensation), he labored for 17 years as a parish priest, then as bishop of Mantua, and in 1892 was advanced to the metropolitan see of Venice with the honorary title of patriarch. On August 4, 1903, he was elected Pope, "a man of God who knew the unhappiness of the world and the hardships of life, and in the greatness of his heart wanted to comfort everybody." The primary aim of his pontificate Pius X announced in his first encyclical letter, viz., "to renew all things in Christ." Here we need but allude to his decree on early and frequent reception of holy Communion; his Motu Proprio on church music; his encouragement of daily Bible reading and the establishment of various Biblical institutes; his reorganization of the Roman ecclesiastical offices; his work on the codification of Canon Law; his incisive stand against Modernism, that "synthesis of all heresies." All these were means toward the realization of his main objective of renewing all things in Christ. The outbreak of the first World War, practically on the date of the eleventh anniversary of his election to the See of Peter, was the blow that occasioned his death. Bronchitis developed within a few days, and on August 20, 1914, Pius X succumbed to "the last affliction that the Lord will visit on me." He had said in his will, "I was born poor, I have lived poor, I wish to die poor" — and no one questioned the truth of his words. His sanctity and his power to work miracles had already been recognized. 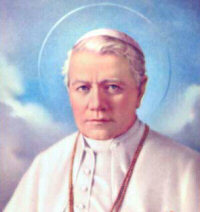 Pius X was the first Pope canonized since St. Pius V in 1672. "He was one of those chosen few men whose personality is irresistible. Everyone was moved by his simplicity and his angelic kindness. Yet it was something more that carried him into all hearts: and that 'something' is best defined by saying that all who were ever admitted to his presence had a deep conviction of being face to face with a saint" (Baron von Pastor). Patron: Archdiocese of Atlanta, Georgia; diocese of Des Moines, Iowa: first communicants; diocese of Great Falls-Billings, Montana; pilgrims; diocese of Springfield-Cape Girardeau, Missouri. "Oh look at the statues! Why didn't you tell me the priest got new statues for the chapel?" "But they are not statues, they're moving. It's the Blessed Virgin!" Thirteen others also came and saw the beautiful woman, clothed in white garments, wearing a brilliant crown. Her hands were raised as if in prayer. All knew that it was Mary, the Mother of Jesus, Queen of Angels. On the right of Our Lady stood St. Joseph, his head inclined toward her. On her left stood St. John the Evangelist, dressed as a bishop. To the left of St. John stood an altar which had a lamb and a cross surrounded by angels on it. The vision lasted about two hours. People who were not at the apparition site reported that they saw a bright light illuminating the area where the church was. 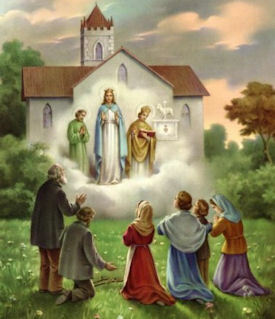 Many of the sick were healed upon visiting the church at Knock.